That rarest of rare-breed applications, the command and control center is the progenitor and propagator of all great interconnection between audiovisual sources and displays. Majestic historical images of massive video wall setups and a multitude of workstations prompt space-age memories of the mission-critical intensity of the declaration, “Houston, we have a problem.” While present-day operations centers are still the loci of intense information analysis, their setups are becoming more flexible, easing environmental stress caused by excessive noise and maladjusted visuals. Now most of the loud, hot electronics are located remotely, and ultra high-definition displays ease eyestrain and provide an infinite array of layouts to simplify data sharing. Despite this progress though, many myths about command and control systems remain in circulation. How about we disprove some of those old notions with some new technology? MYTH #1: THE COMMAND AND CONTROL ROOM IS ONE ROOM AND ONLY ROOM. Reality: Control centers are all about the data that comes into the room, but now their effectiveness is enhanced by the ability to efficiently and securely deliver data to other collaborative entities in the decision-making structure. The Christie Phoenix network-distributed information management system allows users to simultaneously view, listen to and interact with any source of information found in a control room environment, from virtually anywhere. For multi-room, multi-location installations utilized by one or thousands of users at the same time, the Christie Phoenix features a modular system architecture based around one or multiple hardware nodes handling both inputs and outputs to encode, decode and display audiovisual data. And now 4K can be a bigger part of the picture, with the Christie Phoenix Quad-T module, which provides additional 4K inputs and enables users to control and encode real-time information sources anywhere within your Christie Phoenix network. MYTH #2: THE VIDEO WALL HAS TO BE THE SAME ALL DAY AND ALL NIGHT. Reality: Based on who’s working, or what groups are working, a video wall can dynamically change to fit their needs. Whether its a transition from the day shift to the night shift or an elevation of strategic initiatives, changing display needs can be facilitated visually with different sources displayed and also in terms of light levels from day to night. The localized dimming capabilities of the new 55-inch NEC Display Solutions of America X555UNS and X555UNV displays enable backlights to dynamically change based on content. Backlighting behind the panel is controlled based on what’s currently displayed on the 1300:1 contrast ratio screen with 10-bit color processing, so darker content has dimmer backlighting and lighter content may bump the backlights up to their full capabilities, providing a more vivid overall image. MYTH #3: YOU CAN ONLY GO REALLY BIG, THERE IS NO SMALL OR MID-SIZED. Reality: The day has arrived when advanced video wall processing is economical enough to be employed in a wider range of mission-critical video wall systems. 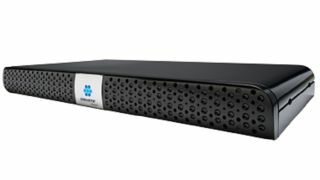 New Matrox MuraControl software and the Network API platform make it possible to custom-build scalable systems that easily manage scaling, switching and compositing of source content including HDCP feeds. MuraControl now supports two models of Matrox C-Series multi-display video cards, the C900 with nine outputs and C680 with six outputs. The graphics cards can also be combined with Matrox Mura IPX Series 4K capture and IP encoder and decoder cards to display external sources on C-Series-powered video walls. That combined with the Network API that gives software developers the opportunity to build their own powerful video wall control solutions for Mura-based video walls makes this a totally sweet package for more than just the mega projects. MYTH #4: CONTENT IS TIED TO THE LIMITS OF THE MONITORS USED. Reality: Au contraire, content can be positioned exactly as the user wishes anywhere on the entire monitor wall, and also shifted, enlarged and reduced in size as required. And all of this in real time, with no delay! That’s right, Black Box new ControlBridge control system and Radian video wall processor allow the creation of massive video walls that improve situational awareness and operator response time. Radian works with all common and modern video formats: DisplayPort, DVI, HDMI, IP, SDI, VGA, H.264; and it supports 4K. Now, instead of being forced within the display confines of 2x4 when you want 1.5x3, you can imagine the whole video wall as one screen or a single, huge monitor, on which the content can be moved about in real time and changed in size as the user wishes. MYTH #5: EACH ACTION-ITEM NEEDS A SEPARATE SYSTEM. Reality: Combine a processor with collaborative visualization software, and you’ve got seamless access to a consolidated, visually precise display of intelligence from across a user’s network. The InFocus Jupiter Catalyst 4K processor and Jupiter Canvas 5.0 collaborative visualization software delivers bandwidth reaching 336 Gbps and manages sources including live streams from network cameras and mobile devices, application screens from PCs and real-time data feeds. Users can view, share and annotate on the live feeds with remote colleagues working on a range of different devices, including smartphones, tablets, laptop PCs, and desktop PCs, or in conference rooms equipped with InFocus Canvas Touch or CRS-4K display endpoints. Catalyst 4K supports up to 28 4K sources, up to 56 HD sources and up to 12 4K displays, which can showcase up to 48 HD sources. MYTH #6: SEAMLESS VIDEO PROJECTION IS GREAT, BUT YOU HAVE TO REPLACE LAMPS ALL THE TIME. Reality: Heard of laser projection? Now we’ve got the longevity and the brightness we need to make command and control TCO dreams come true. And the linear nature of laser light sources means that image quality is consistent across displays, and the entire setup can be modulated to increase or decrease light output depending on ambient conditions and energy consumption goals. Digital Projection’s E-Vision Laser 8500 delivers 8,500 lumens from a stable solid-state light source, capable of producing over 20,000 hours of illumination with minimal maintenance throughout the lifetime of the display, giving it a much lower cost of ownership. MYTH #7: YOU’RE NOT REALLY READY FOR 4K. Reality: Actually, it’s pretty simple. Just connect the appropriate video cables from the video source to the input connector on the Rose Electronics UltraVista 4K. Connect DVI cables from the unit’s output connectors to the appropriate displays. Apply power, install the configuration software on a Windows based PC, laptop or tablet. Then connect an ethernet router or a crossover cable to the UltraVista 4K’s RJ-45 connector for a TCP/IP interface. Configure the output display orientation as desired, sizing the video source to the configured output display grouping. Rest assured the UltraVista 4K Video Wall’s three models are designed to support high-resolution video input from any of three video signal types: dual channel DVI, HDMI 1.4, or DisplayPort. MYTH #8: DON’T MAKE THE SETUP TOO COMPLICATED, BECAUSE YOU’LL NEVER GET IT BACK THAT WAY IN A CONSISTENT MANNER. Reality: New video processing technology translates a complex vision into reality and then saves it for recall by command. Windows can be sized, rotated 360 degrees regardless of the output rotation, and placed in the desired location on the video wall with tvONE’s C3-540 CORIOmaster and then saved as a preset in CORIOgrapher v2 control software. Up to 36 system windows can be used on as many as four video walls, and each video wall can have a maximum of 14 windows depending on the source resolution, frame rate and size of window. In addition, a new resolution editor has also been developed to allow set up for custom, user-defined resolutions. Further, the CORIOdiscover app allows the user to find a CORIOmaster device on a network, log into a unit to update the firmware, change communications settings and create new custom resolutions. MYTH #9: THERE CAN BE NO DAYLIGHT IN A CONTROL ROOM. Reality: Now you can have brightness without a huge power bill or instant decay of light sources. With its new Flagship laser series for 24/7 control rooms, Barco is providing 2x more brightness than mainstream LED-lit video walls, allowing mission-critical control rooms to operate under all lighting conditions – day or night. You can also keep the lights on longer because Barco’s Flagship laser video wall displays are built without troublesome rotating phosphor/color wheels, adding to the extremely long lifetime of the laser light source – more than 11 years in continuous 24/7 operation. Barco Sense X automatic calibration technology is also integrated into this new generation of RGB laser video-walls, continuously measuring brightness and color levels, and ensuring calibration not only inside the individual cubes, but over the entire video-wall. MYTH #10: COMMAND AND CONTROL OPERATIONS ONLY OCCUR INDOORS. Reality: All it takes is one look at Special Operations Forces, and suddenly it seems that some pretty high-tech setups can occur in the wild. CineMassive has been deploying systems relied upon 24/7/365 by every branch of the U.S. Armed Services to provide mission-critical situational awareness in the most demanding and hostile environments across the globe. The manufacturer’s newly released Scalable Mobile Display (SMD) system is built from the same technical backbone as its battle-proven permanent-installation cousins, but modified to provide a uniquely ruggedized and expeditionary package optimized for the constraints of temporary environments. The turnkey SMD kit includes CineMassive’s CineView II LCD touch-capable displays to be connected via Cat-6 or fiber optic cable to an Alpha video wall controller, along with CineNet software, a mobile mounting frame, and cases for transporting the system. MYTH #11: YOU NEED LOTS OF SCREENS TO BE REAL. Reality: Well, actually, maybe one really big screen would do the trick in some applications. LG’s largest commercial-grade direct-view monitor, the LG 98LS95, 98-inch edge-lit LED display, is in itself a video wall. The 16:9 aspect ratio and 3840 x 2160 resolution displays images with brightness and detail and four times the resolution of Full HD (1080p) displays. It has a bezel width of just 14.6mm, and can be mounted in a portrait or landscape mode. LG’s webOS for Signage platform provides an all-in-one hardware and software solution. MYTH #12: BEZELS CAN’T POSSIBLY GET ANY SMALLER. Reality: It defies imagination, but now we’re talking about “Extreme Narrow Bezels” with the new Clarity Matrix MX55HDX LCD video wall display from Planar, a Leyard company. How extreme? Well, the full HD stereo 3D unit has a tiled bezel width of just 1.7mm. It’s even easier to achieve the smallest gap between individual LCD video wall displays with the new and improved Planar EasyAxis Mounting System. An installed depth of 92 millimeters (3.6 inches) makes the 800-nit display compliant with the Americans with Disabilities Act (ADA) requirement for protruding objects, and there’s an added bonus of 10 percent power consumption reduction over previous 55-inch Clarity Matrix models. MYTH #13: ONLY ONE USER CAN VIEW THE DATA, SECURELY, AT A TIME. Reality: As data and content are shared in more and more real-time collaboration scenarios, security is a key priority. For security within the Prysm Visual Workplace ecosystem, Prysm Cloud is built on top of Microsoft Azure, an open, flexible and enterprise-grade cloud computing platform. Azure meets a broad set of international and industry-specific compliance standards, such as ISO 27001, HIPAA, FedRAMP, SOC 1 and SOC 2, as well as country-specific standards like Australia IRAP, UK G-Cloud and Singapore MTCS. Kirsten Nelson is the editor-at-large of Systems Contractor News.